The voices behind some of Disney’s best leads, sidekicks, and villains were almost very, very different. While some characters did end up with top-tier names behind their lines, others went to seasoned voice actors who aren't known for their billing. Read on to learn which famous faces almost brought these animated roles to life. Who knew that two classic '80s TV shows could shape the writing of a Disney movie so much? The Huffington Post reported that when lyricist Howard Ashman wrote the part of Ursula, he had Dynasty's Joan Collins in mind. 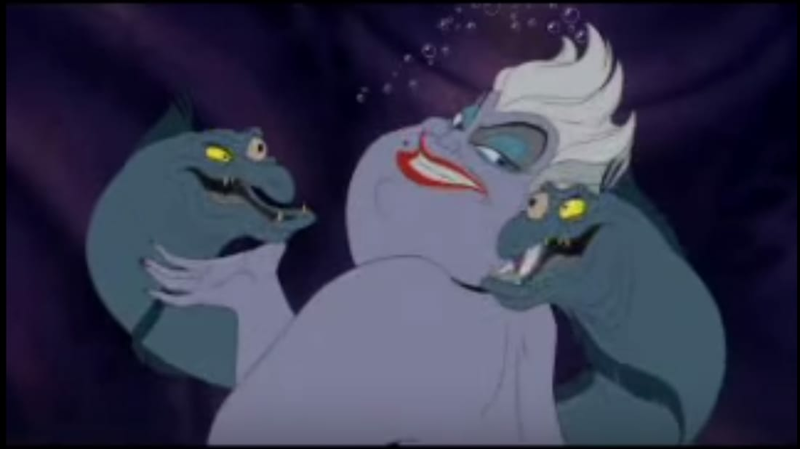 Ashman pictured Ursula's rivalry with King Triton as a soap opera, but Dynasty producer Aaron Spelling was worried that voicing a cartoon character would damage Collins’ career, so she never even auditioned for the role. Disney’s John Musker and Ron Clements, however, had Golden Girls actress Bea Arthur in mind, and approached her for the part of Ursula. In the book Makin’ Toons: Inside the Most Popular Animated TV Shows and Movies, Musker said, "Her agent, I guess, read the script, and it described the witch as having a Bea Arthur-type basso voice ... but she just read it, somehow in her mind, like we were saying Bea Arthur is a witch. I don't think she even gave it to her." Broadway legend Elaine Stritch was also a leading contender for the part, putting a more eccentric spin on the villain. But she clashed with Ashman’s style of directing and he cut her from the process. Eventually, after months of auditions, theater and television veteran Pat Carroll won the iconic part, largely because she understood Ashman's vision and how to voice the character as he had it in his head. Cogsworth, loyal butler to the Beast and BFF to Lumière, was nearly voiced by Patrick Stewart, but his busy schedule—he was right in the middle of his seven-season run as Captain Picard on Star Trek: The Next Generation—prevented him from taking the role. The part eventually went to David Ogden Stiers, who later voiced Governor Ratcliffe in Disney’s Pocahontas. Another Disney great that Stewart had to pass on because of Star Trek? The sorcerer Jafar in Aladdin. Other comedy heavyweights including Steve Martin, Eddie Murphy, John Candy, Martin Short, and John Goodman were all reportedly considered before Robin Williams landed the role of the “ever-impressive, the long-contained, the often imitated, but never duplicated … Genie of the Lamp!” It ended up becoming one of Williams' most beloved roles, for children and adults alike; as The New Yorker put it, "The Genie was a perfect container for Williams’s manic energy and allusive impersonation skills." According to casting director Jen Rudin, Beyonce was in the running for the role of Disney's first black princess, Tiana. "Beyoncé expected an offer, but wouldn't audition and so she didn't get one," Rudin told Page Six. Rudin added that Tyra Banks, Jennifer Hudson and Alicia Keys all auditioned for the part before it went to Tony winner (and Beyonce's Dreamgirls co-star) Anika Noni Rose. In an interview for the Howard Ashman fan blog "Part of His World," John Musker revealed that a young, unknown Jim Carrey read for the role of Prince Eric. Alrighty, then! Thankfully (for the sake of our childhoods), the part went to 16-year-old voice actor Christopher Daniel Barnes, who also later voiced Spider-Man in the '90s television cartoon series. Mulan’s self-proclaimed “serpentine salvation” Mushu was voiced by Eddie Murphy, but according to animator Tom Bancroft, Joe Pesci and Richard Dreyfuss were also considered for the part. The animators were still working out Mushu's look and facial expressions though, and they realized that no one was going to work for the little dragon like Murphy. In the mid-‘90s, the original iteration of the Emperor’s New Groove was a loose spin on the Mark Twain classic The Prince and the Pauper and featured Owen Wilson as Pacha. However, after numerous setbacks, the disaster of a film was almost completely redone—with John Goodman voicing the peasant Pacha—before its December 2000 release. Sykes, the villainous gangster in Oliver & Company, was almost voiced by the “godfather” himself—Marlon Brando. Disney wanted the part to feel like an “evil presence” who was often shrouded in smoke and shadows, and CEO Michael Eisner reportedly approached the actor himself. After Brando turned down the role of Sykes because he didn't believe the movie would do very well, it went to Robert Loggia, who was known for playing "heavies." Although Jack Nicholson wouldn’t actually read for the role of Hades, he did discuss it with Disney. For the “Part of His World” blog, John Musker recalled that the studio tried to woo Nicholson (the character was written with him in mind): “We showed him some test animation done to one of his lines from A Few Good Men where we had a simmering Hades idly playing with a lick of flame as he said, 'Take caution in your tone, commander. I’m a fair guy, but this f—in' heat is driving me absolutely crazy…'" When Nicholson couldn’t reach an agreement with Disney, Kevin Spacey and Phil Hartman came in to read, but eventually the part went to Golden Globe- and Emmy-winning actor James Woods, who took the character in an entirely new direction.